"The Forest Chapel portrays a daydream I've had many times: often while hiking some wooded trail I've come upon a flowering meadow and thought, 'What a wonderful place to worship God.' The idea of a chapel in a natural setting has intrigued me for years. "In The Forest Chapel light glows from the chapel windows, suggesting the warm spirit of fellowship within. Shafts of morning light filter, golden, through the trees, dappling the forest floor with a divine light. The sweet melody of psalm singing rises up, to be joined by the gentle murmur of the brook that flows past the house of worship." 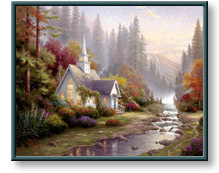 The Forest Chapel copyright© 1999 by Thomas Kinkade is prohibited from being copied.